Doctors sometimes worry about the looming invasion of medical science by computers They are scared that there will now be a flood of digital data which they will have to analyse daily . Doctors are number-phobic and as students of biology , mathematics and statistics have always been a little foreign to them . Many of them get intimidated by numbers. In fact, some take perverse pride in their innumeracy , and trust their intuition and gut feel, rather than try to hone their ability to make sense of numbers. However, the fact is that doctors have always been in the data business. 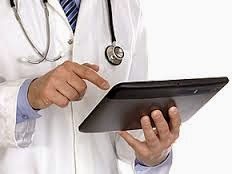 Doctors use numerical data all the time - for example, they check blood pressure; they measure BMI; and they look at skin rashes and use that as visual data , so that they can make the right diagnosis. However, today medical data has changed. There is much more of it, it’s much more complicated, it's available at the doctor's ( and patient's fingertips) and it’s digital. This is both a great challenge as well as an opportunity. Doctors need help with this data. What kind of data should they be collecting ? It’s possible to collect lots of it, but a lot of it is garbage and they need to find out what’s valuable and what’s not. How do you differentiate the signal from the noise? They need help with analysing the data as well. When there’s too much of it, it’s sometimes hard to make out what’s important and what’s not, and this is why computers can be so useful. Doctors don’t need to worry that computers are going to replace them, because no matter how good computers are at analysing data, it still requires a human brain in order to put it all into context, in order to come up with the right diagnosis , as well as the correct treatment plan. There are some things doctors are good at , and there are some things which computers are good at , and intelligent doctors will use computers as peripheral brains , in order to be able to provide better care to their patients. Good doctors have always been better than bad doctors at analysing data . They have access to exactly the same data which other doctors have, but they use this far more intelligently ! Just like Sherlock Holmes saw the same clues which the policeman did, but was able to make sense of them far more efficiently , good doctors can process the data more intelligently. With bad doctors, the problem is often GIGO - garbage in, garbage out. A lot of this expertise is implicit , and doctors find it hard to share it with other doctors. The good thing about computers and number crunching is it helps to make this tacit knowledge a little more explicit , so that other doctors can learn the skills as well . Using this cumulative wisdom, the entire medical profession can do a better job with managing their patients.